UPDATE: Secondary reports suggest the shark did not wash up dead onto shore, but rather was caught as bycatch in a fishing net. The shark has since been nicknamed Toothless (in a nod to the 'How to Train Your Dragon' films) and it being kept on ice awaiting preservation. Bulbous head, 50 (yes, 50!) rows of tiny teeth, flabby body ... yep, it's a megamouth shark! The 66th megamouth shark ever seen washed ashore this morning in Marigondon, a port in the Albay province of the Philippines. Initial reports suggest the shark (Megachasma pelagios) was approximately five metres (16 ft.) in length, but until a necropsy can be performed, the finer details about the animal (including the cause of death) will remain a mystery. Sightings like this are rare ... so rare, in fact, that when the first megamouth was spotted in 1976, a new shark family, genus and species had to be created! These bizarre deep-diving animals are characterised by their bulbous snouts, loose skin, poorly calcified skeletons and (of course) their mega-mouths, which extend upward beyond the eyes. Only two living specimens have ever been studied by researchers, so every find is a big deal for science. "The 6th shark offered the most important insights into the behaviour of this species," notes Florida Museum of Natural History's Carol Martins. Scientists were able to tag and follow the shark for two days – something that had never been done before! "One of the conclusions of these observations is that megamouth probably [spends] the daytime in deep waters and [ascends] to mid-water depths at night," she says, adding that this may have to do with the krill that make up the megamouth's diet, which migrate from deep to shallow water. 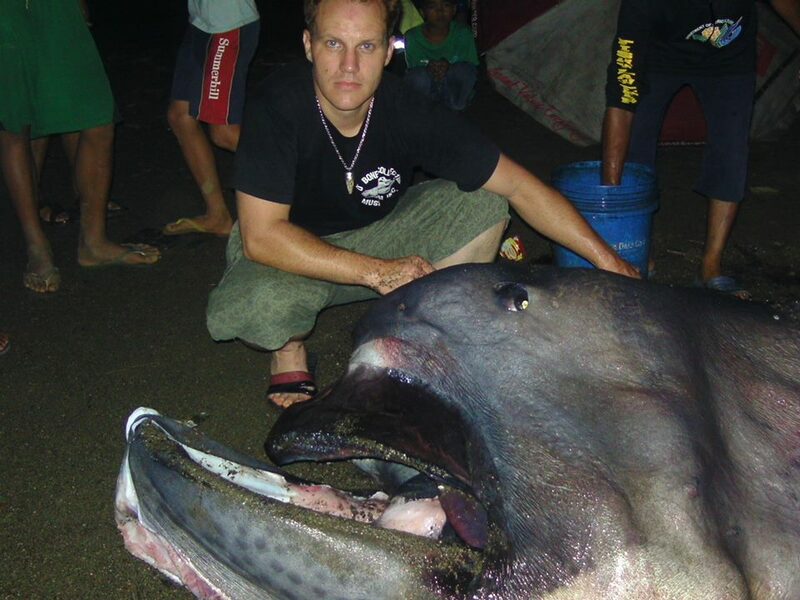 Now with fifteen sightings, the Philippines has recorded the second-highest number of megamouths of any country in the world (next to Japan), including this incredible 5.5-metre (18 ft), 900-pound behemoth, which has been carefully preserved at D' Bone Collector Museum by the museum's owner Darrell Blatchley.